Also known as part two of our series on designing a room in your home from start to finish! If you missed part one, you can check it out here for details on how I plan out some of the main elements in a room design based on the problems I have with the room and the needs I need the room to meet. Today? 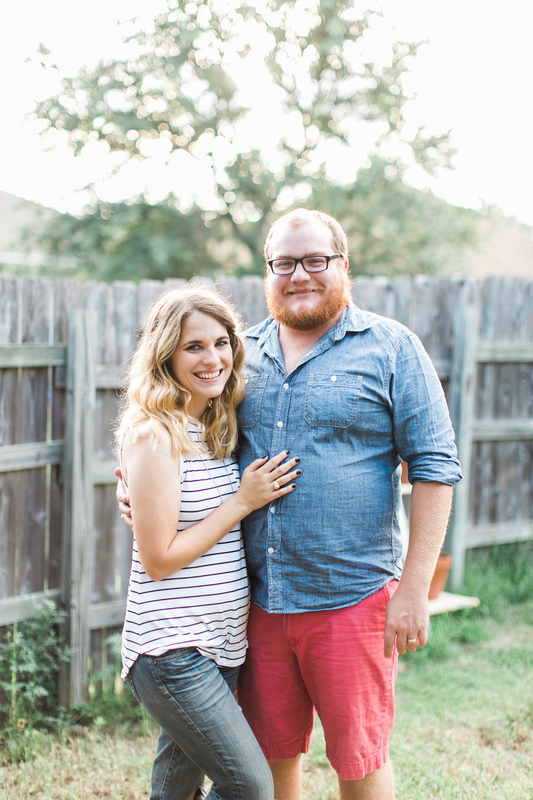 We’re going to talk about how to design your own room in your house from scratch! I’ve finally finished putting together the mood board for Jackson’s room, and I’m really really pleased with it and excited to see how it’s all going to come together. I won’t chat too much about the actual process of making a mood board in this post because we’ve already covered that in pretty great detail on this post about how to create a mood board. Instead, I’m going to spend more time today talking about my process for choosing what I want the room to look like and how in the world I went from nothing to this well-organized plan. Ahhh! I love it! Do you love it? I’m so excited about this room. But, let’s get to the meat of this post – you want to know how I got here. How did I go from “I have no idea what I’m doing in this room” to “this is exactly the direction I want to head”? Well, let me tell you about it. Please note – this post assumes that you’ve already gone through the process of deciding what your main problems are in the room and how you’re going to solve them. If you haven’t, go back and check out this post. Browse Pinterest to find out what you like. I always start on Pinterest – it’s the fastest and simplest way to figure out what you like, what you don’t like, and what works together. I searched a few different terms for this room – things like “kid’s room ideas,” “modern kid’s room,” and “kid’s room design”. What you want to do here is search a broad term related to the room you’re designing and look for the rooms you love. I spent well over half an hour searching and only found one or two rooms that really spoke to me. Keep in mind – you’re not searching for specific ideas you like (for example, I saw some cute organization ideas and some fun art, but I was looking at entire rooms to find a general vibe and color scheme). Once you find the one or two rooms you like, pin them! As you can see in the mood board, I had two rooms that really spoke to me for the direction of Jackson’s room – the first is one of the rooms I shared in my last post that shows the general layout for the built-ins that we’re going to do, and the second is that beautifully-designed room from Oh Eight Oh Nine – I loved the colors, the general feel of the room, and the layered look. Choose your color scheme. Next up you want to figure out the direction you want to go for the colors in the room. The Oh Eight Oh Nine room was my jumping off point for colors – I wanted it kind of dark and moody, but still playful with pops of color. I also already knew that I wanted to do one super saturated, dark color on the wall behind his bed (in-between the two bookcases) – my original plan was a deep blue but since we’ve already used similar colors in our bedroom and in our kitchen, so I wanted to branch out a bit. I’ve really been into deep greens lately (and Jack is a fan, too), so I browsed Behr’s website to find a color that fit what I was looking for. Now, keep in mind that this might not be the exact color you use – you’re still going to want to get samples and try them out in your room – but it should be pretty close. The color I landed on for the mood board is called Secluded Woods. For the rest of the walls, I wanted to avoid white (since the built-ins would be white) and gray (since we do that everywhere), so I landed on a pretty, pale tan-ish color (this swatch is Coliseum Marble by Behr). With two colors down, I was able to fill out the rest of my color palette pretty easily – I loved the mustard-y yellow in my inspiration photo, and I’m trying to incorporate black into all of my room designs (because I just love how it brings a room together), so those went in there along with a creamy white to balance it out. I like to do 4-5 colors in my color scheme because that feels the most “finished” to me, but there are no rules to how many colors you choose! Think about what you’ve already got. Once I had my color scheme and my general vibe for the room, it was time to think about the things we already have in our home that would work well in this space. 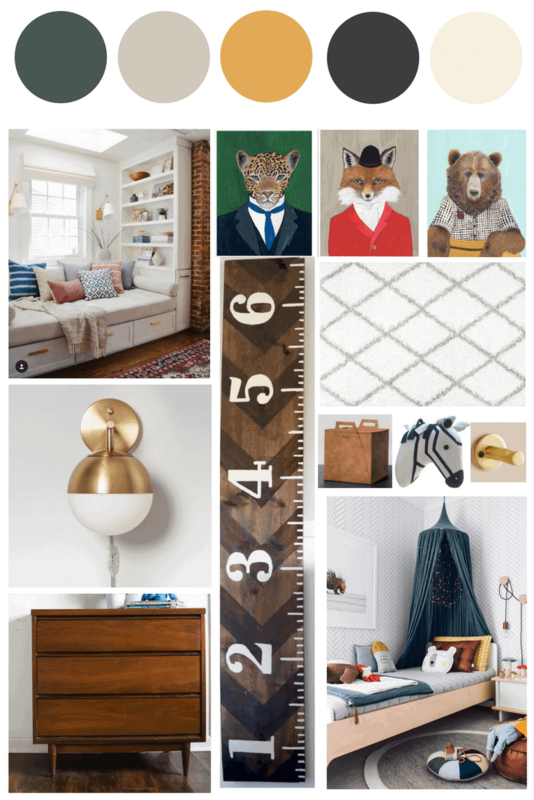 I knew for sure that I wanted to re-use the rug we already have, Jackson’s mid-century dresser, and the growth chart I made for him, so those got plopped into the mood board. I also mentally combed through all of the art we had in his room previously and picked out a few things that would work well with the new room – we may end up using more than what’s pictured here, but I know for sure we’ll want to use all of these! This is a very inexact science, but when I’m trying to figure out if I want to use something I already have, I just find a photo of it and add it to the mood board, then I look to see how it layers in with everything else. If it sticks out like a sore thumb, it clearly doesn’t belong. But, if it seems to flow right along with everything else then it stays! Fill in the gaps. Once you’ve got the main vibe (I’m intentionally avoiding the word “theme” because I’m not a fan of themed kid’s rooms, but you could pick a theme here, too! ), color scheme, and know what you’re using from your home, you can fill in the gaps with a few more products that you might like to use. I knew I wanted a wall-mounted lamp for above his bed, so I just hit up Target to see what they had – and they had exactly what I wanted! I also wanted to bring in some leather accents (inspired by my jumping-off-point photo), and those leather bins from the Hearth & Hand collection have been on my mind ever since I first saw them – I think they’d be perfect for the little cubbies we’re creating under his bed. And finally, I wanted to find some cute and simple hooks to put on the small wall between his door and the closet – it’ll be a perfect place to hang up a jacket or a hat (or a cape). Anthropologie is my go-to place for cute hooks and, since we already have a lot of other excitement happening with the art, I kept it simple with these plain brass hooks. Walk away for at least 24 hours. The final step? Close your computer and walk away for a while. Go live your life, think about other things, and don’t give your room design a second thought. Once it’s been a day or two, come back and look at it with fresh eyes – do you still love it as much as you did? Is there something that stands out to you or doesn’t fit in with the rest? Once you’ve had some space from the design, you may notice a few things you want to shift. Of course, you can always course-correct as you’re working on the room, but you want your mood board to be an accurate representation of what you’re going for to help guide you along the way as you’re making decisions. And that, my friends, is how I took this room from zero to fully planned. I still have to pick out a few things like the exact paint colors, bedding, and other accessories, but this mood board will be my roadmap when I’m making decisions and will make everything much easier. 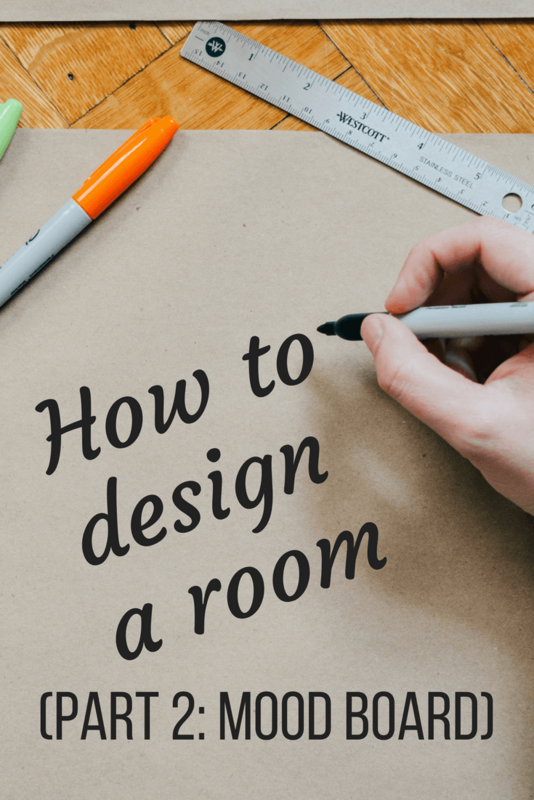 So, what’s the next step in designing a room? Get started! For us, the next thing on the agenda is to get the built-ins done and the room painted. I want to wait to pick out bedding or anything else until we land on an exact color for the walls and work out all of the kinks with the built-ins, so that will be priority number one. I’m not sure how long it’ll take to knock that part out, but you know I’ll be back with an update once we get it done!